Plan of Jinsen (Chemulpo) Harbour. 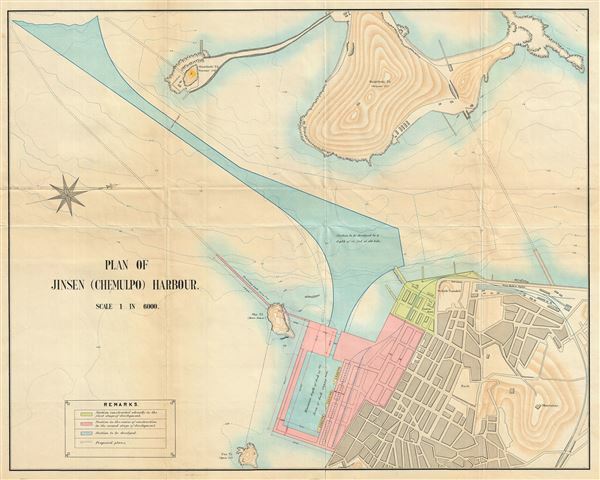 This is a rare and attractive 1950s map or plan of the Incheon or Incheon Harbor in South Korea. It detail the harbor in the Incheon Metropolitan City located about 30 miles southwest of Seoul. The plan details the sections already constructed, in progress, dredged and proposed by color coding. It notes important landmarks including the Jinsen railway station, landing pier, custom house, etc. along with topography. Known by several names including Jemulpo or Chemulpo, used during the opening of the port in 1883, the city was called Jinsen during Japanese rule. In the early 1950s, around the same times this map was made, South Korea (backed by the United Nations and the United States) and North Korea (backed by Russia and China), were in the midst of the Korean War. Incheon was the scene of the Battle of Incheon, an important fight that eventually led to the victory of the United Nations. This is an important and rare map from that period.